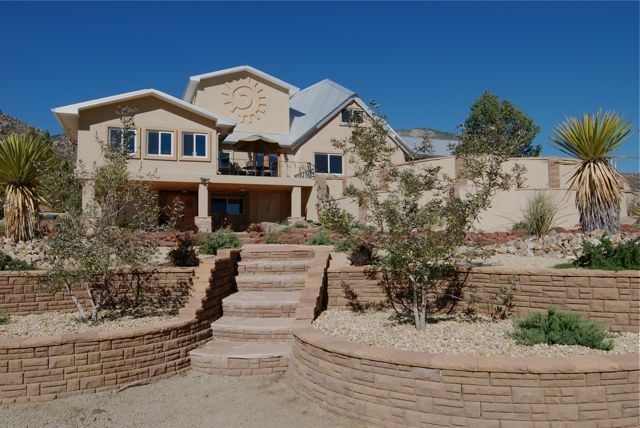 The Villa de Las Montañas, Albuquerque’s most luxurious and secluded rental, is located in a truly awesome canyon in the Sandia Mountains just east of Albuquerque, only 20 minutes from the airport, Albuquerque Studios, and Balloon Fiesta Park. It offers two master suites, a guest room with two twin beds, a gourmet kitchen, an office/theater with high-speed Net access and surround sound, Jacuzzi tubs, breathtaking mountain views, three outdoor patios, one of which has a gas grill and dining area, flat-screen TVs in almost every room, and award-winning décor. And if golf is your game, the Villa is located between two of New Mexico's best courses, the Sandia Resort & Casino and Paa-ko RIdge Golf Club. Camille King is the Villa's managing partner. She is also an executive in the oil and gas industry, a professional photographer, and has a flair for interior design, as witnessed by the Villa's decor. When she isn't working, she's hiking, rock climbing, and trying to become a better cook. You are bound on the west and north by the Cibola National Forest. The Monzano mountains are south. Magnificent views of all. 500-thread, Egyptian cotton sheets. Nothing but the finest for our guests. Completely furnished gourmet kitchen. A personal chef can be available for one meal or your entire stay. You will find many movie DVDs throughout the Villa. This balcony is off the San Francisco Suite. Both north and south patios are wonderful for dining. The grill is in the north patio. A beautiful home with amazing views in a great location. We really liked the open floor plan and the space was very comfortable for our family. We would definitely stay again and would recommend to anyone coming to the area. Camille responded quickly to our questions and was very helpful. Amazing experience! Beautiful home. Excellent beds. Well stocked with things you need. Will be back. FYI...if rain is in the forecast, you might want an SUV the drive can get rough. The house accommodated our group of small kids, parents and grandparents withh space to spare. Gorgeous views, and delightful interior. I hope the house is available next time we come to Albuquerque. Went with two co-workers to Albuquerque and stayed in Carnuel house. It was fun to drive up dirt road to beautiful house. The landscaping seemed well cared for and the house was up to date and clean. We sat in living room on big leather sofas and talked at night. We sky-gazed and searched around house for bunnies outside and we saw one. Great house, beautiful surroundings. Lovely house and well decorated. The house is great for cooking and dining while the multiple terraces provide the convenience to be in or out off the sun as desired. The interior is stylishly decorated and makes the stay enjoyable. The climate control in the house is not great during the winter months as it does not provide equal heating throughout the house. Some parts will be too hot while others remain too cold based on the distance to the heat exchanger.